The Graveyard Book by Neil Gaiman is a book for young adults which I enjoyed immensely. The story begins with a triple homicide, the surviving child wanders into the local graveyard and is raised by ghosts. Now if that opening sequence doesn’t grab your attention, nothing will! 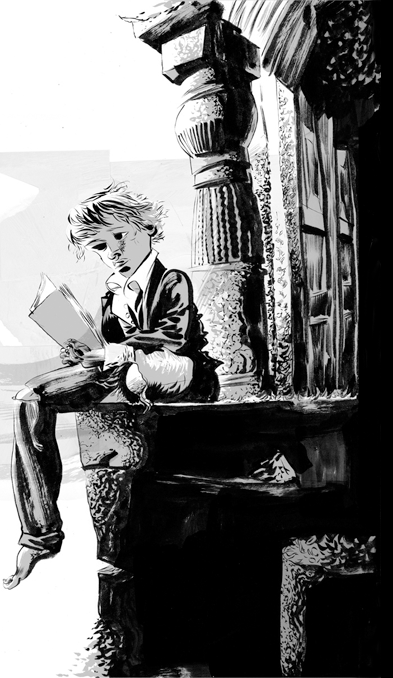 The young protagonist, Nobody Owens, is brought up by the various ghosts who live in the graveyard and they all have a story to tell. I enjoyed the fact that most books and films dramatize graveyards as a spooky place where sad things happen, Gaiman turns this idea on it’s head and makes the reader feel safe within the walls of the cemetery and wary of the outside world. In most graveyards, there are hundreds of people from hundreds of different backgrounds and time periods buried beneath the soil. The author used this feature brilliantly, I loved hearing the different characters deaths and ideas of life and death. They ranged from a witch burned at the stake to an ancient Celtic spirit. Although the book starts brilliantly, I felt let down at times at the way the book meanders along towards the end point, I felt that Gaiman could have incorporated Nobody’s quest to find his parents killer more into the development of the tale. I also thought Nobody was quite a bland character, he didn’t have many personable traits, in my mind he was the perfect son. Nobody learns different ghoulish powers from various ghosts, I was thinking how I’d use such skills to other more mischievous ends! My edition of the book was brilliantly illustrated by David McKean, only upon finishing the book I realized there is a graphic novel version produced, which I must pick up at some stage.I would recommend this book to younger teenagers as well as young adults. I enjoyed the book as an adult, it is funny and full of historical references, an aspect of which I enjoyed. 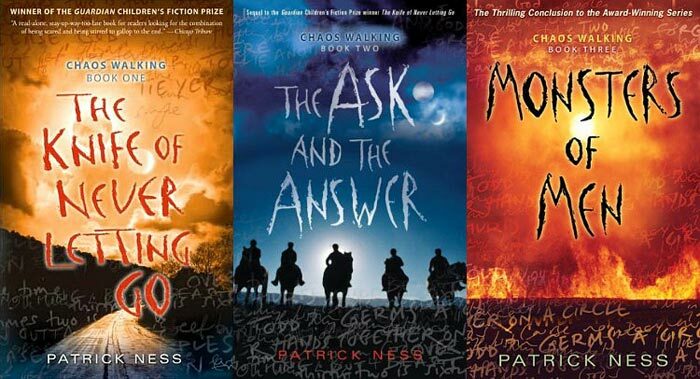 Chaos Walking Trilogy by Patrick Ness- As good as Tolkein’s or Pullman’s trilogies? People dismiss Young Adult books to the teenagers of this world, but you are missing out on some of the best books around if you do.The Chaos Walking Trilogy is a series of books by American born British writer Patrick Ness. I think this trilogy will get the recognition it deserves. After a period of time, I believe it can sit proudly on the same shelf as J.R.R Tolkein’s Lord of the Rings and Phillip Pullman’s Dark Materials. Now I know readers, especially fans of Tolkein would say that nothing can compare to the Lord of the Rings but I believe the Chaos Walking series is similar in the way the protagonist goes on a physical and spiritual journey to save the world. I thoroughly enjoyed the series. It is made up of three books- The Knife of Never Letting Go, the Ask and the Answer and the final book Monsters of Men. The first book of the trilogy is the best in my opinion, it centres on a boy called Todd Hewitt who grows up in a world where no females exist, and everyone can hear each others thoughts. Even the animals thoughts can be heard. Todd lives in a dystopia of fear and suppression under the rule of the ‘Mayor’ who is the arch enemy. An incident forces Todd to go on the run from the government and the adventure begins. The fact that everyone can hear each other was a brilliant idea. I felt this was the author suggesting that we are all connected nowadays, that we have no privacy with social media and therefore we ‘hear’ each others thought. I loved the relationship that existed between Todd and his loyal dog Manchee. I also thought one of the many evil characters in the story, Aaron was a supremely complex and complicated person. The Ask and the Answer is a very different book. Todd is situated in a town where he must decide which side he must join in the middle of the war. Ness once again makes it very hard for the reader to distinguish what might be the ‘good’ side and what might be the side to oppose. I enjoyed this feature as you could easily empathize with one army and make an argument for their cause. The ambiguity of empathy creates an uneasiness to the book, leaving the reader constantly torn between the opposing factions. I felt this book however lost the cutting edge and fast pace of the first. The plot meanders along and it is very unclear what the end point might be. The book is merely a prelude to the concluding book where all the questions are answered. Monster of Men is the final book in the trilogy, it is a continuation of the second book as the war rumbles on, Todd begins to become a man and is forced to make huge decisions as both a leader and as an individual. Todd begins to hone his own mental strength in order to use it against people. He is faced with many moral decisions. The ending is brilliant to the trilogy and brought great closure to the story. Because all the males of the planet can hear each other, the book is written in a very unusual style where one must adjust. The narrative is a running commentary on what Todd is thinking so nothing is left out. We also get to hear what the other characters are thinking which makes the book clear and focussed. The most interesting aspect of the book is it is laden with bad grammar and spelling mistakes when Todd is thinking. This was done to remind the reader that we are reading Todds mind, it plays on his accent it also also that he was illiterate in the story and couldn’t spell. This made me empathize with Todd straight away but I know other readers find it frustrating and wish to correct the mistakes as they are reading the story.The trilogy is full of love, misery, cruelty and above all suspense. These three books are some of the best pieces of writing I have read. I encourage you to read the first book and get started. I think they will go down as modern classics. I would argue they are as good as anything Pullman or Tolkein has written. Do you agree? If you don’t, even better! Please leave a comment. I have been reading a lot of Patrick Ness‘ work lately, the Chaos Walking trilogy was exceptional and More Than This was certainly another thought-provoking book, it had a poor ending unfortunately but was a great read nonetheless. 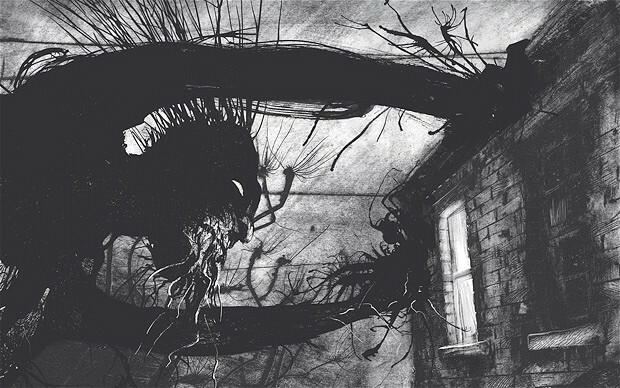 A Monster Calls by Ness is a terribly sad and cruel book but deals with the raw human emotions one would feel with a dying parent. Ness was asked by the family of deceased author Siobhán Dowd to complete the book based on the manuscript Dowd had started before passing away from cancer. The young protagonist in the story Conor is going through the turmoil of watching his mother die slowly and painfully before his eyes from cancer. Conor has other worries though, he is visited frequently by a horrific monster outside his window most nights. The monster is both a hindrance and a help to young Conor and he struggles to see if the ghoul is real or is it just simply the manifestation of his troubled mind. I loved guessing whether the monster was real or imaginary in the story, it never becomes clear but it fades into insignificance as the book draws to the end. The monster flips from being both friend and foe depending on it’s humor,this lead to an edge of uneasiness in the narrative which kept one guessing. The book is dark and desperately sad. It is a compelling read as it takes the form of a fairy tale, the monster tells three stories in the book which are entirely unconventional stories which are supposed to teach Conor some meaning in his battle with grief. However, the stories are cruel and puzzling, I enjoyed this aspect of the book, I also felt that the book really dealt with the true emotions of death, not the typical Hollywood style grief. Conor is not heartbroken, nor does he mope around and feel sorry for himself. He is angry and embarrassed. He hates the attention of being the only child of a sick mother. He hates feeling different. As harsh as it sounds, he is almost relieved by his mothers death in spite of loving her as much as any son would. The book is short, it could be easily read in an hour or two, the illustrations in the book by Jim Kay are haunting and powerful. They are some of the most moving pictures I have seen in any book. 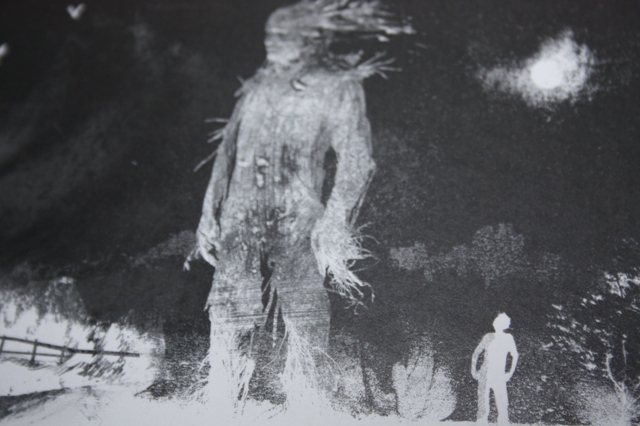 The monster is enormous and grotesque, the pictures are dark and grainy. The illustrations underlines the enormity of the burden Conor feels as he stumbles through the story.It really added to the book. 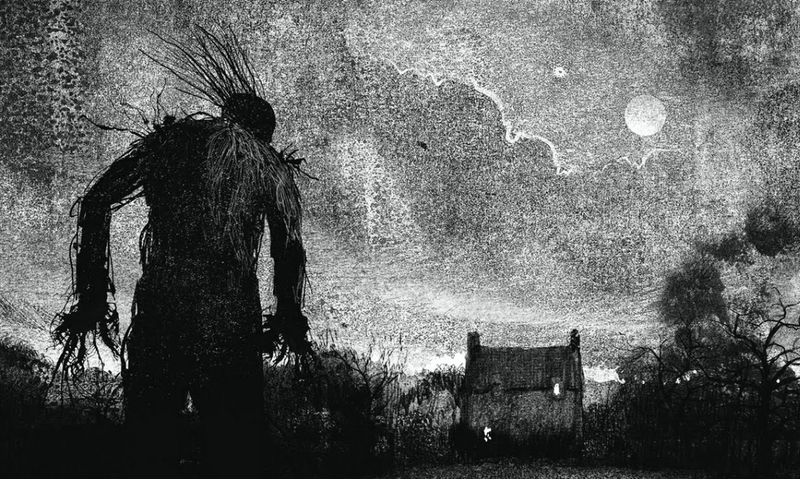 A Monster Calls is a book every person who grieves should read. It is also a book I would recommend to a teenager or young adult who is experiencing the loss of a parent or an ill relative. One could not have but a heavy heart when finishing this book.